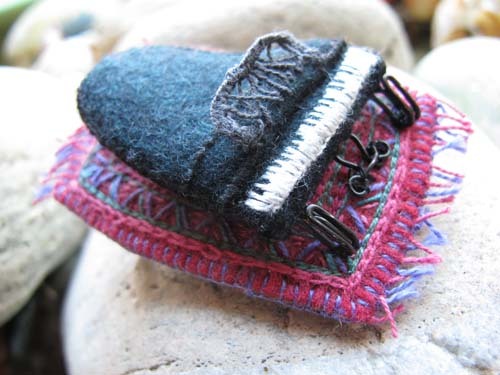 This entry was posted in Embroidery, Felt, Gift, Pins by Salley Mavor. Bookmark the permalink. Cette broche est adorable. Une belle histoire qui se poursuit en musique et aux couleurs d’Istanbul. That is absolutely brilliant. It is nice that you still have the contact and can help repair a damage done by fire – the loss of mementos is devastating. Wonderful work. 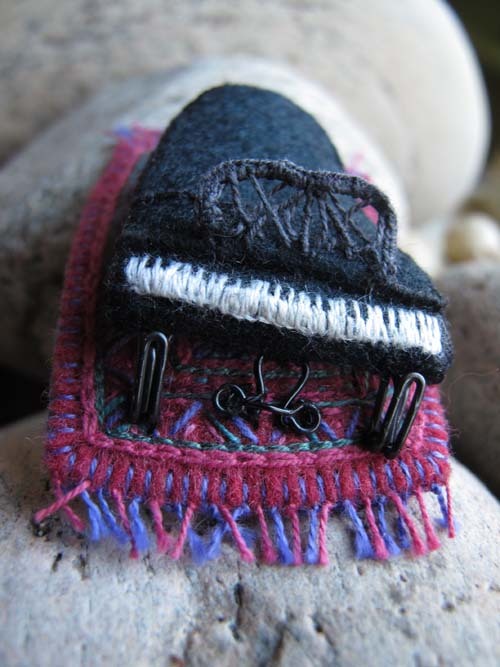 You never cease to amaze me, the little piano pin is wonderful. You have gone way beyond even yourself with this pin, Salley. The hooks and eyes – oh to have your vision. I looked at the piano and wondered if you hinged the lid so it lifted up to show all the strings inside. That would be just like you….The carpet is captivating. Marvelous little piece with such a clever use of hook and eye! Salley, the piano is wonderful and your use of the hooks and eye are so cleaver. The rug is so imaginative. We were in Turkey not too long ago and I agree with you that rugs are sold where ever you look. Some how, I came home without a new rug. As always, I love your work and have introduced my grandchildren to your books. This is such a wonderful piece and love how you used the hooks and eye. I am sure she will treasure it. Your piano pin is delightful, and I loved reading about your other pins. How incredibly thoughtful of him to order that pin for his wife! What a lovely story, how wonderful that your hand crafty items are so valued by others. Makes all the stitching worthwhile. Hi Salley! I’ll add to the chorus – the pin is wonderful. I read your other pin posts (Nice to hear about Niki!). You say you don’t recall making a doctor’s bag. I don’t know if you made more than one, but I had you make one for Kim our senior year! Sadly lost in the fire – but now replaced with a beautiful piano, her true passion. Thanks again. David, thanks for writing a comment. Now that you mention it, I do remember making an old fashioned style doctor’s bag for you to give to Kim! I love David’s books (have several and used them all while teaching second grade) and love your original designed pin for his wife. Thanks for letting us all know about this great gift of friendship, which Kim can wear with love. Oh, my, what a darling pin you have made.! The story was very touching, too. I cannot imagine losing all one’s handmade items! It was wonderful that you made this special piece for your friend. Such a clever design, too! Loved seeing this.